Everyone wants their PC top and running smoothly.For this each and everyone must clean the clutter and remove all unwanted files. Whenever you install, uninstall and even while use any applications , a lots of log files are created. They are much useful for debugging purpose for application developer but still they can called unwanted file for most of the users. 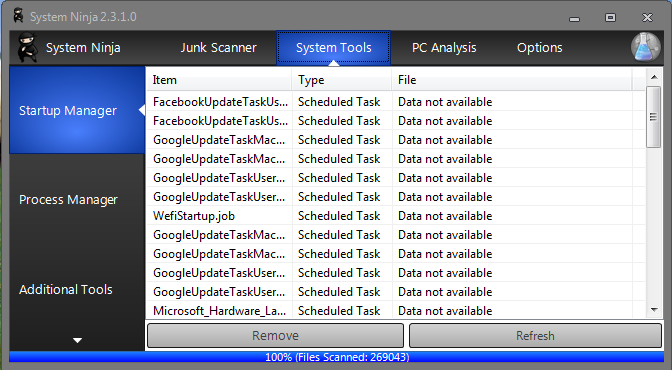 So if you are regularly trying new and new software then there might be 1000’s of such files present in your PC. They are unwanted and takes a lot’s of space. Sometime they may be in few GB’s in size. Actually they are useless and harmless. But sometimes due to huge in number they might became a problem for your PC. Some common problems they cause are, Low disk space, wastage of memory and sometime they may lead to blue screen errors. If you want to remove them then for this purpose there are thousands of utilities available on internet, some of them are paid while some of them are free. So we are going to discuss a new free utility which will help you to clean all this clutter. Yup ! It is System Ninja by Singular Labs. System Ninja is very small in size and portable as well. You can download it to your PC in just a few seconds. Once downloaded, install it, Open it. It has a small, classical and simple interface. 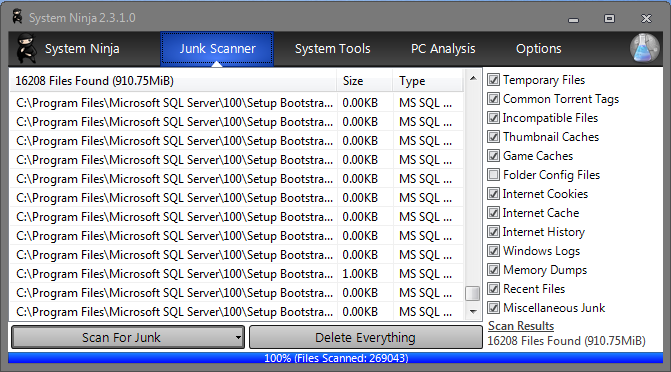 Just you have to click on Scan option and then it will scan all the unnecessary files on your PC. It also supports drive specific scan, so you can include or exclude specific drives from scanning. Once scanning is completed, It will show you the number of unwanted files with paths and types and also the space consumed by them. Then you have to click on Delete Everything to delete all those files. As here in my case you can clearly see that, My PC is having 16208 numbers of unwanted files and they are consuming nearly 910.75 MB. System Ninja, works on dual cleaning engine. It is actually a cloud based system. System Ninja initially scans for all known unwanted files and then also scans all those locations which are generally contains unwanted files and generally not know by many of the other cleaning applications. It even also cleans the cache, cookies and session data of all web browsers irrespective of whatever you have installed and whatever you are using. Apart from this System Ninja, comes with various others tools such as Start up manager and processor manager. They can be really useful to tweak your PC. 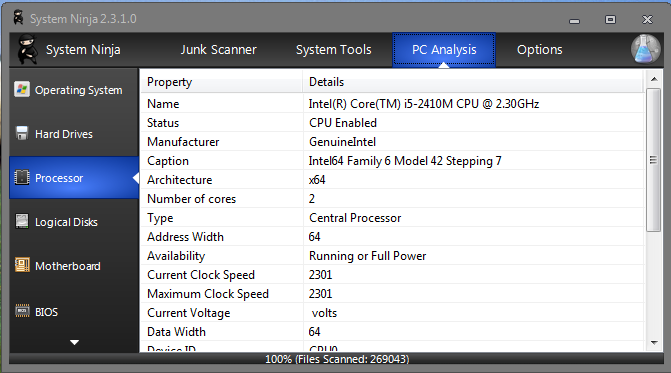 Apart from all this tweaking and cleaning tasks, System Ninja also provides a useful information about your PC. You can do system analysis with this software. Operating System, Hard disk related, processor, Motherboard and BIOS information can be obtained using this software. It also comes with some advance options, which you can explore yourself. System Ninja can be downloaded and installed on your PC, and it is also available in portable version. You can download any of them using following link. On gaming, I don’t feel I have performed any smart games to the card floorboards.